I posted last week about finishing the Ombre Triangle quilt I had been working on, or rather off and on, for far too long. I had shared how it felt like the project was just dragging along and I think the big dissatisfaction I had with it was that I was never really able to get into the creative "flow" that I usually find when I quilt. Do you know about "flow"? Call it being in the groove, absorbed in the process, or whatever, but it's that state of being when you are focused on a project and lose all track of time. It's addictive to be in that state, so I guess I'm in withdrawals a bit. When you're in the state of flow, the ideas and the execution of them are in perfect harmony. This is a fabulous state to be in when creating a new pattern, improv piecing, free form applique, drawing, painting, whatever. Things just flow from brain to hand and it's just all....flow-y. Angels sing in the background, the seam ripper is forgotten and you get stuff done. 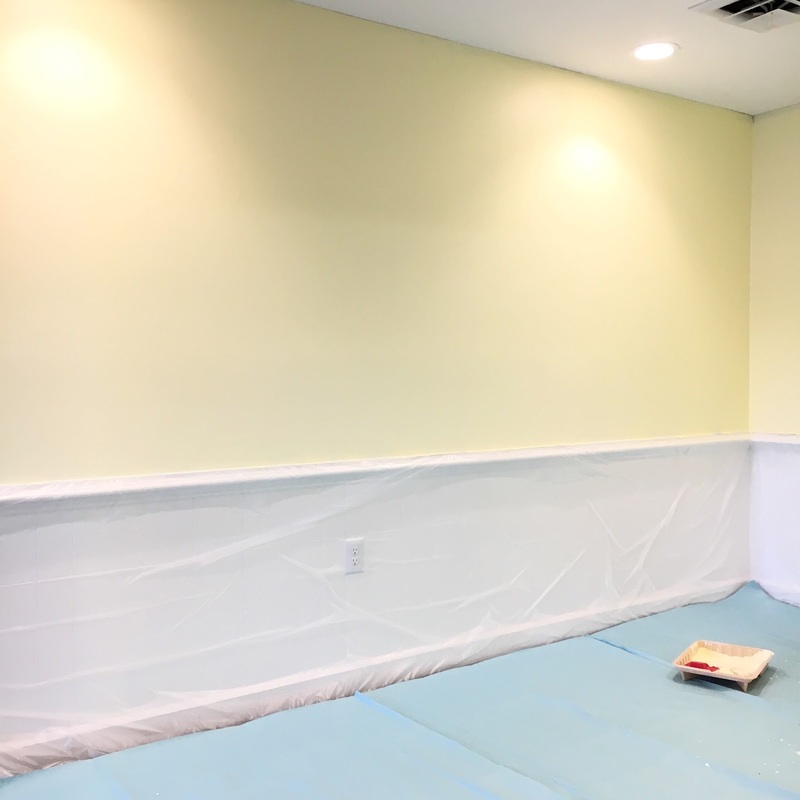 I did find a bit of that state yesterday while working at our new shop location, painting the walls a cheerful, sunny yellow. I think the color is called "peaceful calm." Seems appropriate to me. I stayed until 11pm painting! When you're outside of the creative flow, you can still be creative, but it can seem disjointed and harder. More like work and less like fun. Less creative too. It can feel forced. If you are a creative soul, and I bet you all are, you know what I mean about flow. Sometimes it seems magical and elusive, but it is also something we can cultivate. How do we cultivate flow? Well, there are folks who are much better on this subject than me, but I know the first thing is to give ourselves permission to create and experiment. Yes, that sometimes giving ourselves permission to fail. We can also set aside time for our creative pursuits. That's probably pretty close to giving ourselves permission to create. No one really leaves a life free of concerns these days. Even if you're retired, I know days can get busy with family, travel, service and charity projects. There's always the mundane of course; housework, bills, etc. For most of us there are the concerns of work, kids, maybe elderly parents and other things that can keep us busy. You are of no use to anyone if you don't give your soul what it needs. So make time to dabble in your creative pursuits and get into the flow of what makes your heart sing. Flow is also aided by setting aside a place to be creative. A separate studio is a pretty sweet thing, but it could also be having a grab and go set of tools and materials for a more portable project. It could also be a nice walk or trip outdoors for creative inspiration. One of the things I'm super excited about our new shop location (to open June 1!) is that it has proper spaces to separate different activities. A workshop for the hubby and his sewing machine repair. (Seriously, you should see the explosions of dust and sometimes glitter that occurs when cleaning a machine! Don't neglect to get your machine properly serviced.) An actual office, a space for the kids when they are in the shop (just in time for summer vacation! ), and my favorite, a classroom/studio. The classroom/studio will make it easier to have classes of course, but will also be my studio. Where I can do my creative thing without having to keep it sales-floor presentable. No stomping upstairs tenants either! This will help get a semi permanent video arrangement set up so I can do more videos. Funny aside, I got an email the other day from a cosmetics company that referenced my number of YouTube followers and proposed working together on sponsored content. Clearly he hadn't actually looked at my videos or he would have seen that my face is only seen in a few videos! Nope. Not gonna happen. So there's just 3 things you can do to find that flow in your creative pursuits. What things do you do to find your flow and in what activity are you most likely to be doing when you are in flow? By the way, I flipped my ombre triangles quilt over to inspect my machine binding and fell back in love with it. The back shows the chunks I grouped the 60 degree triangles into for quilting. Gotta love quilts with pretty backs. Looking forward to seeing the new shop pics and seeing more of your wonderful creations and tutes. Carla, I am so excited I can barely stand it! 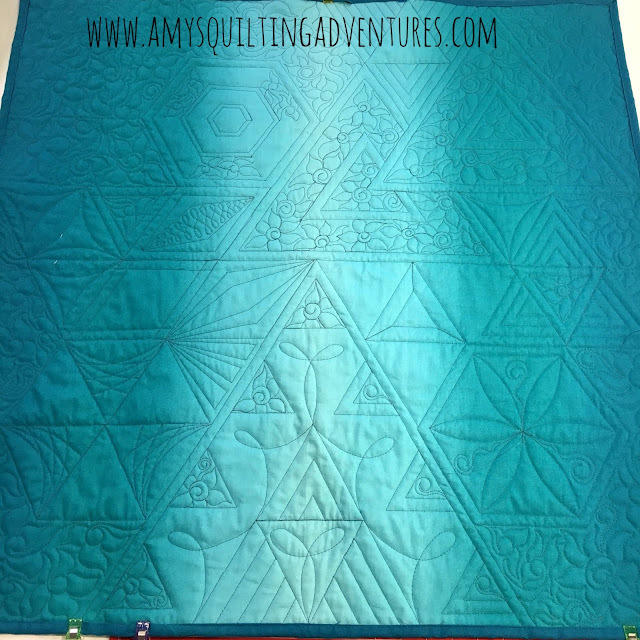 I've missed my quilting and sharing my quilting adventures via video. Painting can be therapy - doing walls where you have just a straight run with no windows gives you a chance to relax and, well, just no pressure. Plus it's heading to a new goal so it heads towards happiness! Sometimes it's good to play with something - I dabbled with felting. Never did that before - made half a rabbit and put it all away. Hubby said it was just another arty thing that made mess, but at least I had a go, I was well happy with the way it was going. Not one to zone out with though - lots of ouchies! For me it ended up another UFO so back to the sewing I went. Hmmm, must find that box . . .
LOL, I've seen some great felting projects, but I thought I'd poke myself too! Your quilt back (front, too) is seriously artistic. I want to be able to quilt like that when I grow up! Can't wait for you to get into your new quarters; it sounds like it will make things easier for you. 73? You rock it! I need a dose of whatever you've got. Congrats on the new shop! Love the back of your quilt. And right now I'm just to tired to think about creative flow. Maybe looking at your work would count to get in the flow as it is always inspirational! I think there's always some downtime between episodes of flow. Sometimes it can be frustrating, but then something sets it off and you're back in the groove. May you find the rest you need and get back to creative flow.